The Ground-Based Electro-Optical Deep Space Surveillance (GEODSS), which can track objects as small as a basketball more than 20,000 miles in space, play a vital role in tracking space objects, particularly those in deep space. Over 1,200 objects, including geostationary communications satellites, are in deep space more than 3,000 miles from earth. There are four operational GEODSS sites that report to the 21st Space Wing, headquartered at Peterson Air Force Base, CO. Sites are located at Socorro, N.M.; Maui, Hawaii; Diego Garcia, British Indian Ocean Territories; and Morón, Spain. The GEODSS system is the successor to the Baker-Nunn camera, which was developed in the mid-1950's to provide surveillance data. The GEODSS concept was developed and researched by Massachusetts Institute of Technology Lincoln Laboratories at an experimental test site located at Socorro, N.M. the site is still used by MIT. To perform its mission, GEODSS brings together the telescope, low-light-level television and computers -- three proven technologies. Each site has three telescopes, two main and one auxiliary, with the exception of Diego Garcia, which has three main telescopes. The main telescopes have a 40-inch aperture and a two-degree field of view. The auxiliary has a 15-inch aperture and a six-degree field of view. Four computers work with the telescopes and cameras. Moreover, the telescopes can be remotely opearted from Edwards AFB, CA, where the 18th Space Surveillance Squadron, 21st Space Wing, which operates the sites, is located. The system only operates at night when the telescopes are able to detect objects 10,000 times dimmer than the human eye can detect. Since it is an optical system, cloud cover and local weather conditions influence its effectiveness. Photometric measurements are taken using the rate track mode, which follows the motion of the satellite instead of tracking the motion of the stars. The telescopes move across the sky at the same rate as the stars appear to move. This keeps the distant stars in the same positions in the field of view. As the telescopes slowly move, the GEODSS cameras take very rapid electronic snapshots of the field of view. Four computers then take these snapshots and overlay them on each other. Star images, which remain fixed, are electronically erased. Man-made space objects, however, do not remain fixed and their movements show up as tiny streaks which can be viewed on a console screen. Computers measure these streaks and use the data to figure the positions of objects such as satellites in orbits from 3,000 to 22,000 miles. This information is used to update the list of orbiting objects and sent nearly instantaneously from the sites to Cheyenne Mountain Air Force Base. 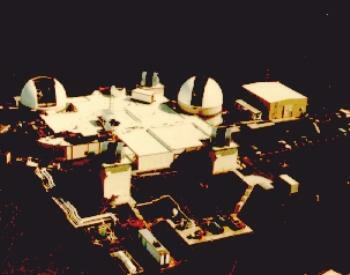 The auxiliary telescopes at Socorro, NM, and at Maui, HI, were upgraded to mains in 1997. GEODSS SLEP extends the operational life of the Ground Based Electro-Optical Deep Space Surveillance System (GEODSS). Replaces the aging Sensor Controller Group (SCG), Data Processing Group (DPG), and Data Communications Group (DCG) to maintain SSN tracking capabilities for objects in deep space and geosyncronous orbits.